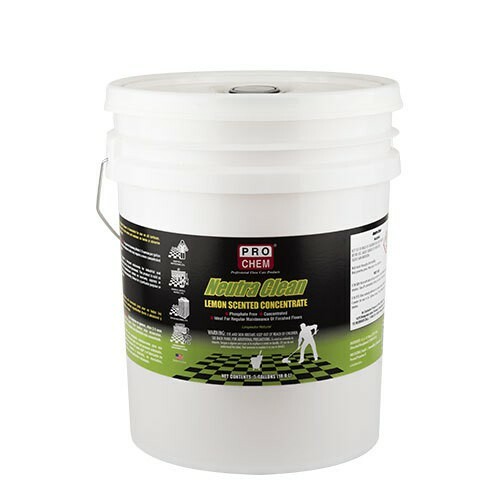 Neutra Clean | Pro Chem, Inc.
NEUTRA CLEAN is a safe, yet hard working neutral cleaner for floors and other surfaces. Powerful cleaning action makes this product ideal for both manual and automatic scrubbing of floor finishes. Low foam makes rinsing easy and leaves a film free surface. NEUTRA CLEAN has a fresh lemon scent and is economical for daily use to keep floors clean. Works well in hard water and contains no harsh or abrasive ingredients. For general cleaning dilute 2-3 ounces per gallon of water. More stubborn soils may require a more concentrated dilution.